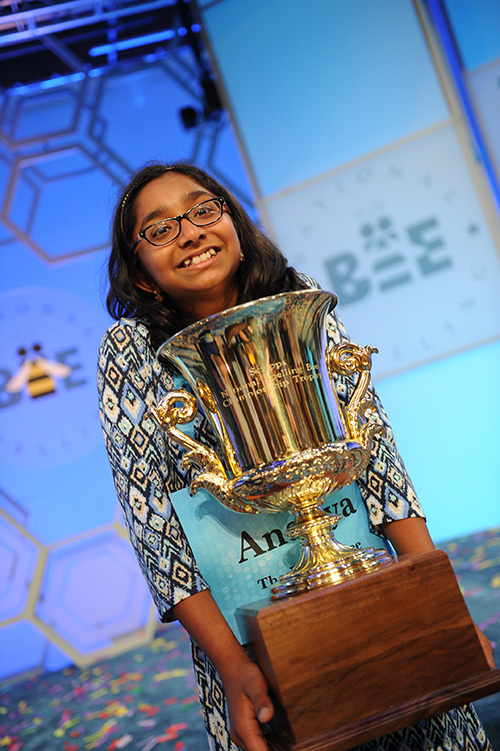 After 19 rounds of head-to-head spelling, Ananya Vinay secured her victory over Rohan Rajeev, a fourteen-year-old speller from Edmond, Oklahoma. Ananya likes to volunteer because she likes to help people. She’d like to be a doctor, scientist or a writer, and she likes reading mythology and adventure stories. “I like finding stories behind words, investigating them further,” she said. One of her favorites is Philomel, a word that means nightingale. It comes from the tale of a princess who was turned into a nightingale. She's also a fan of the Golden State Warriors, and she likes Steph Curry.